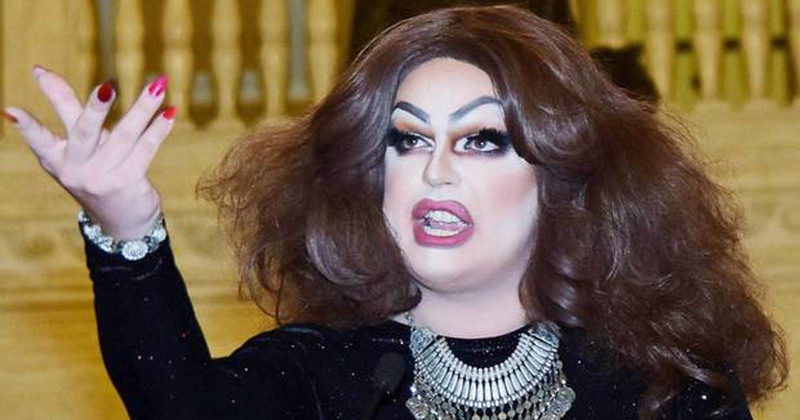 Belfast drag queen, Electra La Cnt made a speech about bigotry in Northern Ireland at Belfast’s Stormont last Sunday, an she didn’t take any prisoners. Videos 3 August, 2018 . Written by Brian Finnegan. Appearing at Alternative Queer Ulster at Stormont, drag queen Electra La Cnt told the Northern Irish LGBT community to stop validating hate speech by engaging with bigots. Speaking about her decision to wear a tiara covered in HIV positive blood at Pride 2016, which was blasted by leader of the Traditional Unionist Voice party, Jim Allister in the Belfast Telegraph this week as “sick, disgusting and twisted”, Electra said it was “a symbol of defiance built around HIV”. “I refuse to ask for acceptance from those who oppress us,” Electra went on to say. “Those who oppress us are bigots, bigots who refuse to change their mind and instead prefer hate over love and I will not engage with those people any longer,” she added. She blasted Belfast Telegraph for the publication of columnist “Nelson McCausland’s homophobic and transphobic rants”. When asked to comment on Allister’s criticism by the Belfast Telegraph, Electra said refused because “you will not use my words to profit homophobia and transphobia, and you will not use my story for that either”. She also went on to criticise companies who profit from Pride parades. “Paying lip service to the community counts for nothing. Selling t-shirts for profit that goes nowhere near the queer community is literally profiting off our community without putting back into it. Finishing her speech with the statement: “We are defiant, we are queers,” and a roar, “Up the queers!” Electra received a huge reaction. Watch her full speech below. 3 August, 2018 . Written by Brian Finnegan.